Strong spatial and seasonal variations in temperature and moisture availability mean that both potential and actual evaporation vary spatially and temporally. The highest values of potential evaporation (about 2000 mm a-1) are observed in the deserts of Central Asia which receive the highest input of solar energy. Potential evaporation declines northwards reaching approximately 125 mm a-1 in the Siberian Arctic although topography and water bodies disrupt the latitudinal distribution. Low values occur in the Far East because of the humid climate and higher cloud cover which lowers the input of heat (Borisov, 1970). 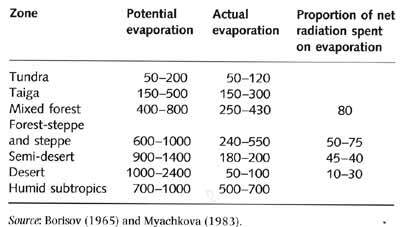 The distribution of actual evaporation, which is controlled by the availability of both heat and moisture, is different (Table 3.1). Deserts exhibit the lowest values of actual evaporation because of the lack of moisture and likewise low values occur in the tundra zone because of the lack of heat. Actual evaporation is the highest in the humid subtropics of Transcaucasia. Another maximum occurs in the mixed forest and forest-steppe zones of the European territory, the Ussuri basin in the Far East and in Western Siberia. Evaporation occurs between April and October and annual patterns reflect the distribution of evaporation during the warm season. Between November and February, actual evaporation is extremely low or virtually zero across most of Northern Eurasia with the exception of the Black and Caspian Sea regions, the Barents Sea, and the Pacific Seas. Only by March do monthly evaporation totals reach 10 mm in Central Asia and Transcaucasia as temperature increases and spring rainfall provides moisture. The spring evaporation patterns are extremely inhomogeneous because they depend on the presence of snow cover, the amount of snow and the rate of snow melt. It is the melt water that ensures that there is no soil moisture deficit in spring-early summer north of the Kiev-Moscow-Tobolsk-Irkutsk line.